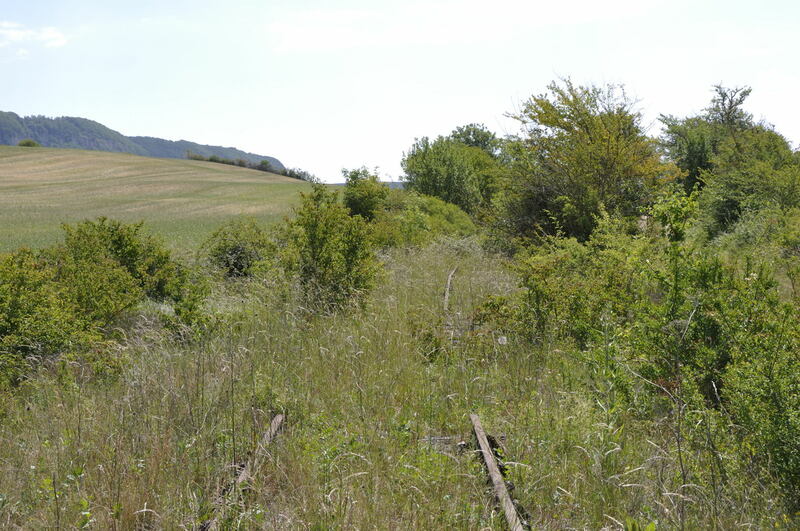 A quick look at the remains of the Tournemire-Roquefort to St Affrique branchline. 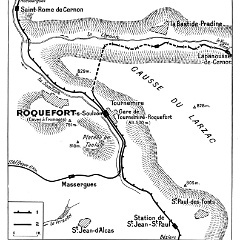 1 Tournemire-Roquefort in better times for the railway showing the developments at their maximum extent. 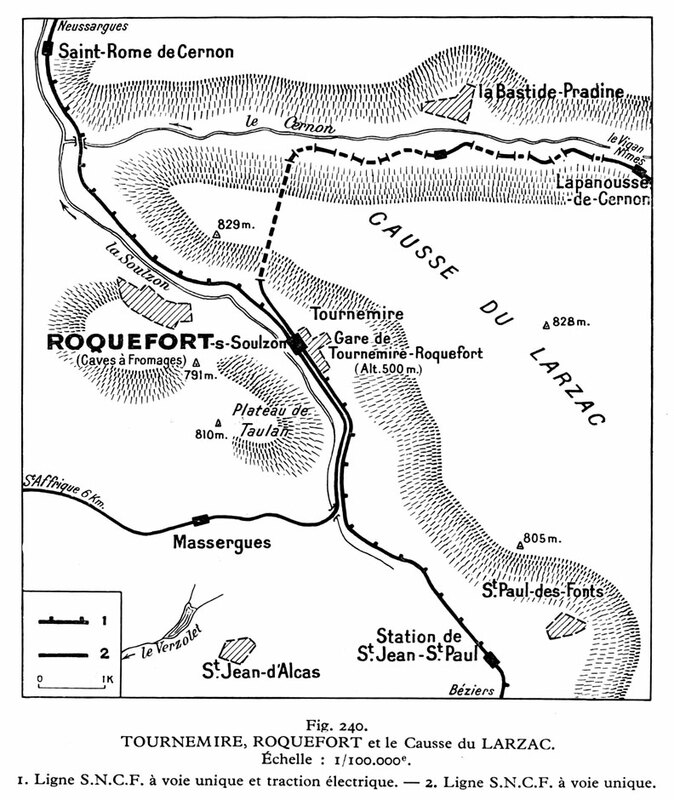 Taken from Henri Lartilleux's "Géographie de Chemins de Fer Français Premier Volume 'La S.N.C.F'. 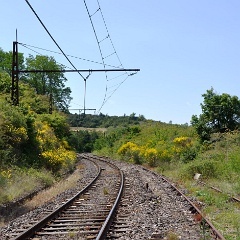 The branches off the electrified la Ligne des Causses were once hope to link Le Vigan to Albi. 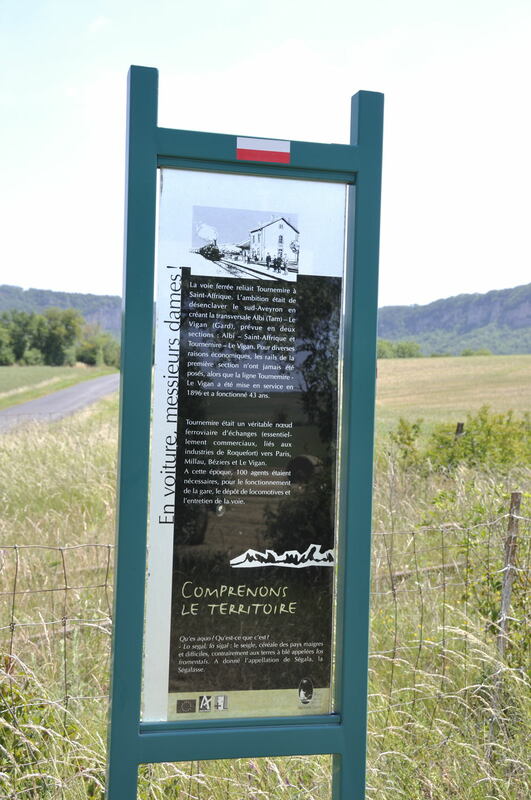 St Affrique was as far west as the line ever got. 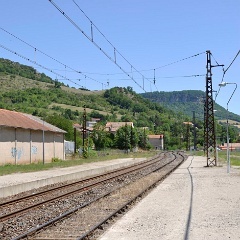 2 At Tournemire-Roquefort station looking south. 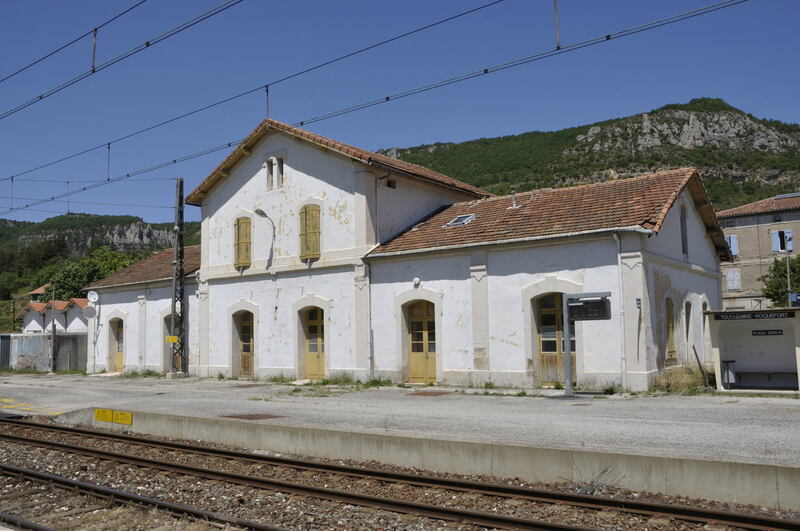 Once this station boasted an overall roof and several more platform faces than the two it barely requires anymore. 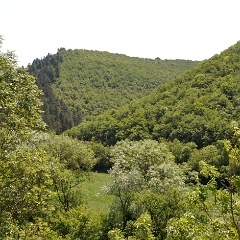 20 June 2011. 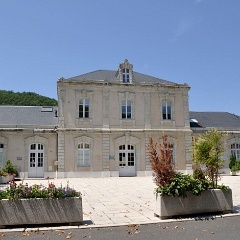 3 Tournemire-Roquefort station building. 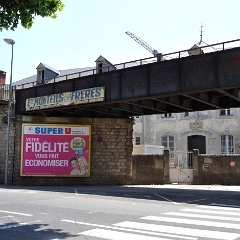 20 June 2011. 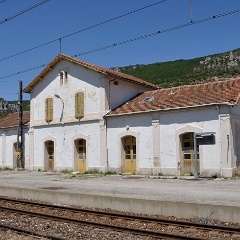 4 At the south end of Tournemire-Roquefort station. 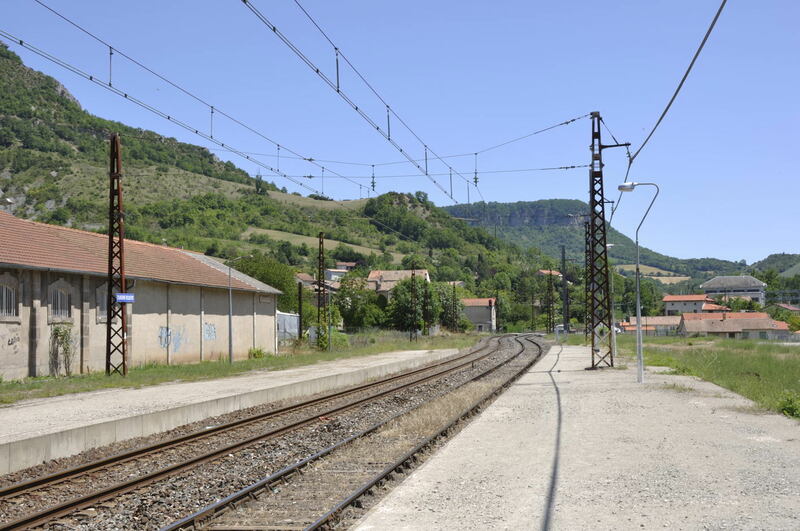 St Affrique line trains ran out of the station parallel to la Ligne des Causses on the righthand line. 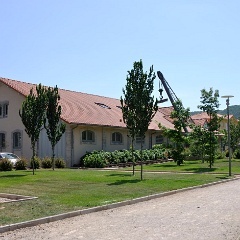 20 June 2011. 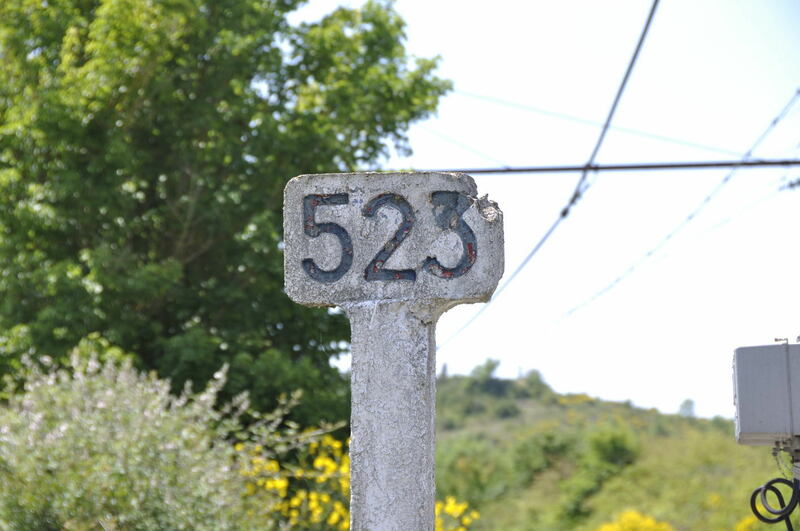 5 Km 523 of la Ligne des Causses - site of a level crossing on both lines. 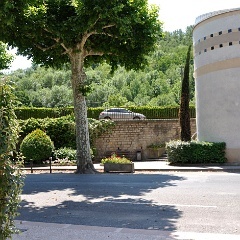 21 June 2011. 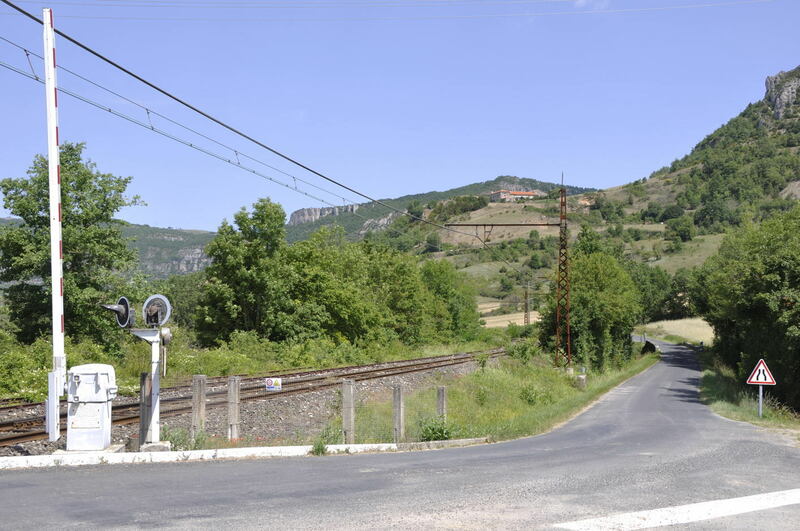 6 Viewed from the level crossing at km 523 la Ligne des Causses is on the left with the remains of the 1992 closed St Affrique line on the right. The two lines parted company a short way further on. The gradient here is 20/1000 (1 in 50) climbing away from the camera. 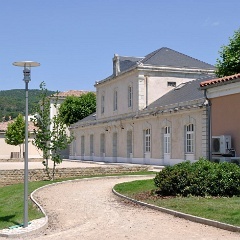 21 June 2011. 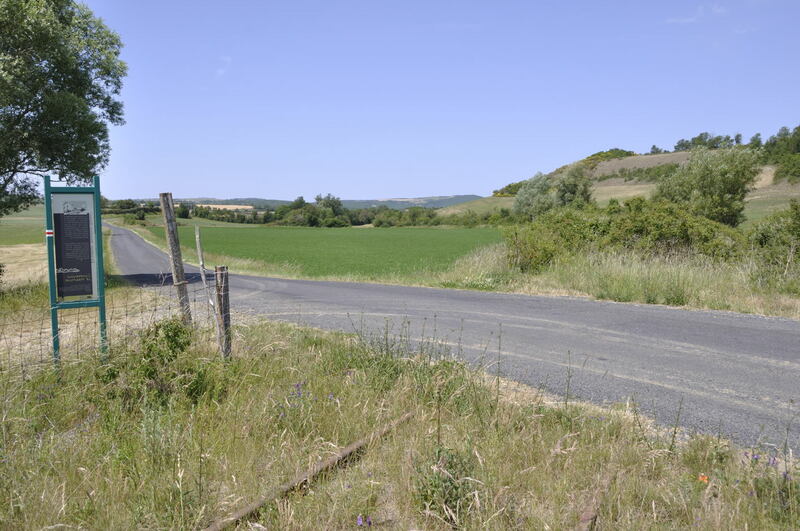 7 Looking back towards Tournemire-Roquefort at km 523 level crossing. 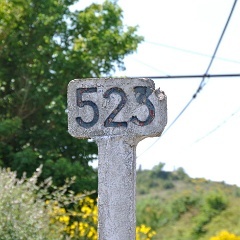 The road is the D559. 21 June 2011. 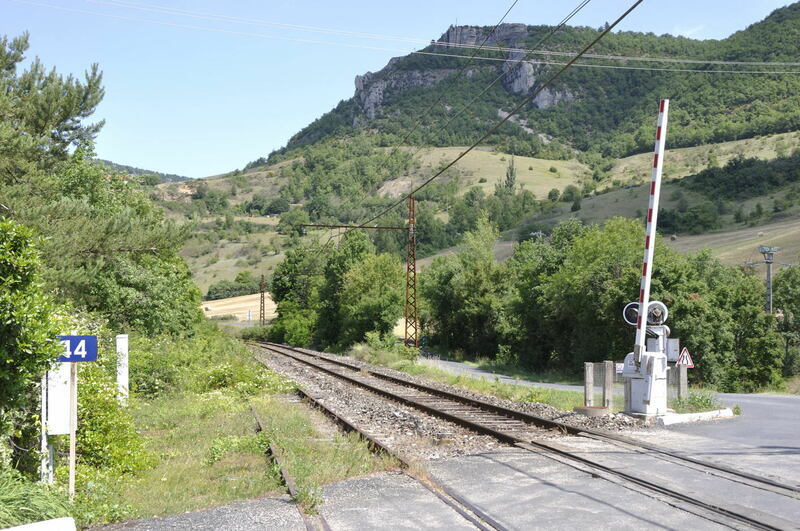 8 Looking back towards Tournemire-Roquefort at km 523 level crossing. 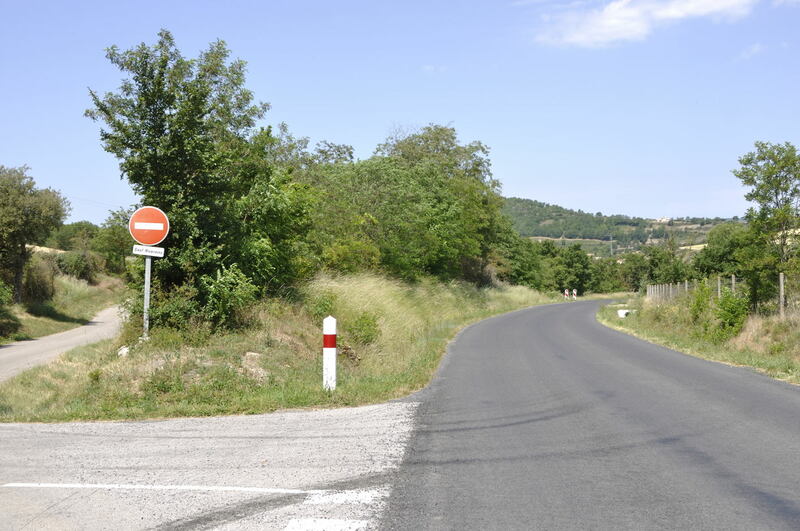 The Causse du Larzac is on the right. 21 June 2011. 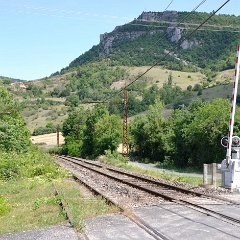 9 Looking back towards Tournemire-Roquefort at km 523 level crossing. 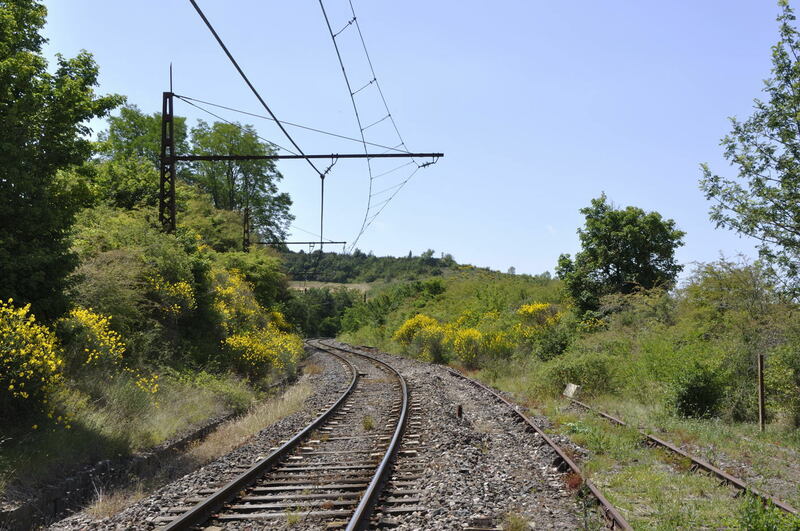 The disused St Affrique line has been left in place but closer to Tournemire station modern sginalling equipment has been planted between the rails. 21 June 2011. 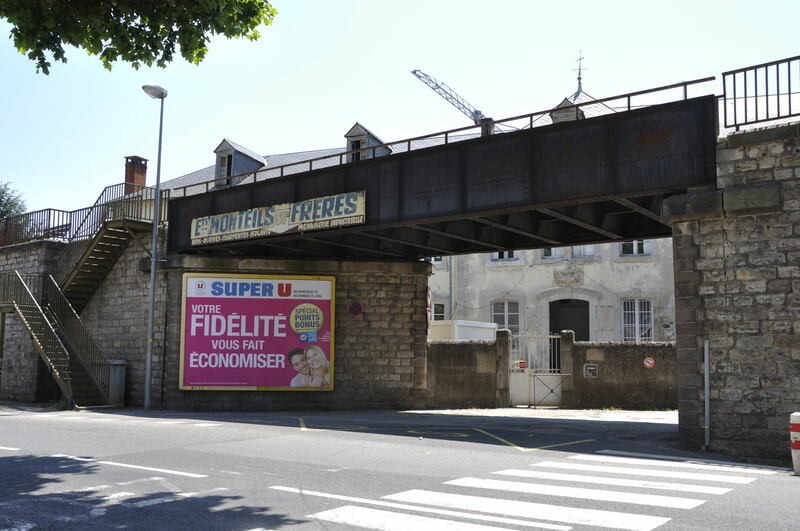 10 On the branch at its crossing of D559, looking towards St Affrique. 21 June 2011. 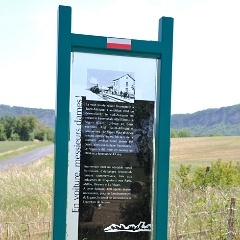 11 At the crossing with the D559 there are several interpretation boards such as this one. 21 June 2011. 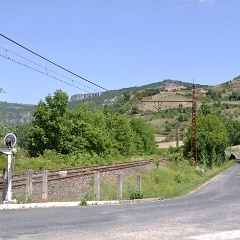 12 From the crossing of the D559 looking towards the junction with la Ligne des Causse and Tournemire-Roquefort. 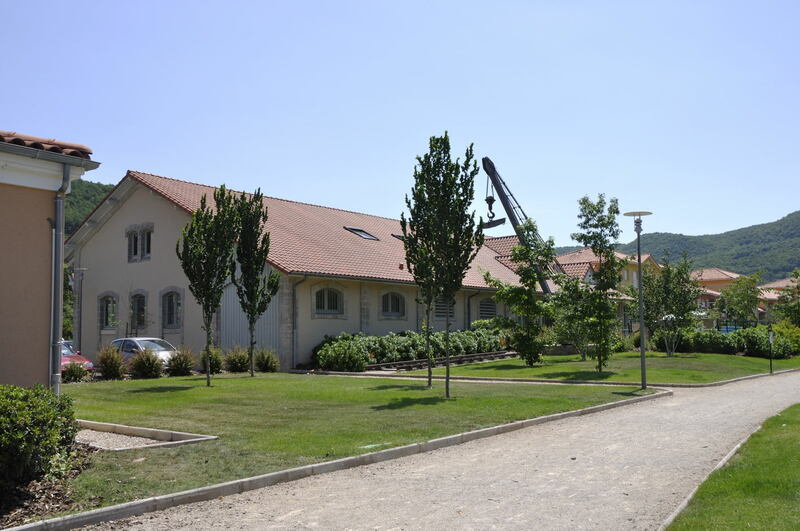 21 June 2011. 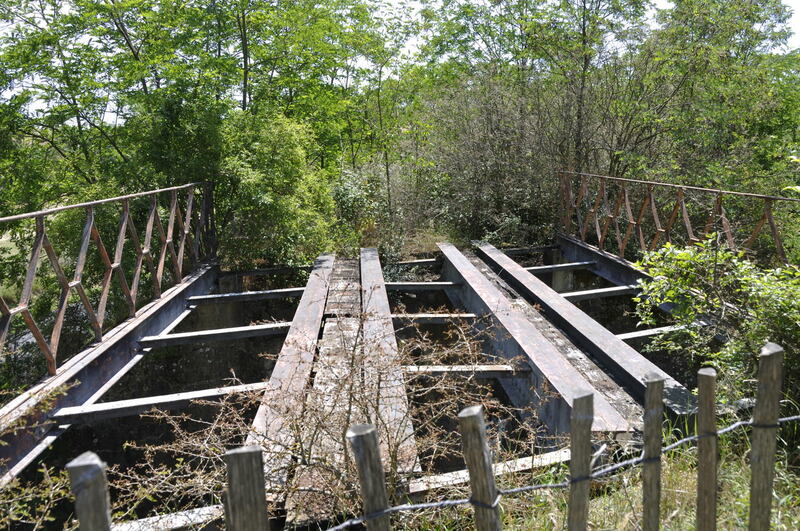 13 This bridge used to take the line over the D559 near to St-Jean-d'Alcapes. 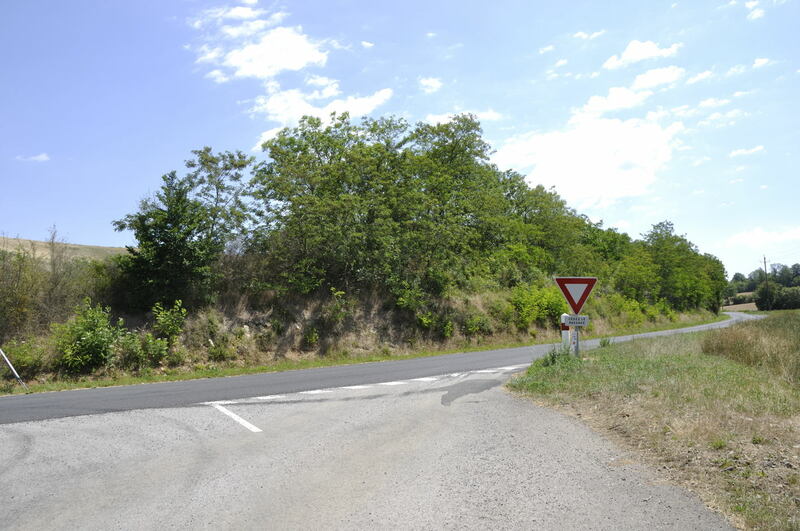 The road has now been improved as following photographs will show. 21 June 2011. 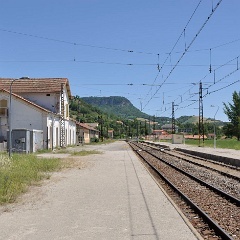 14 On the trackbed looking towards St Affrique near St-Jean-d'Alcapes. 21 June 2011. 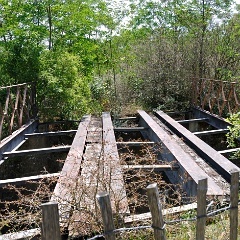 15 The remains of the bridge over the D559 near to St-Jean-d'Alcapes. 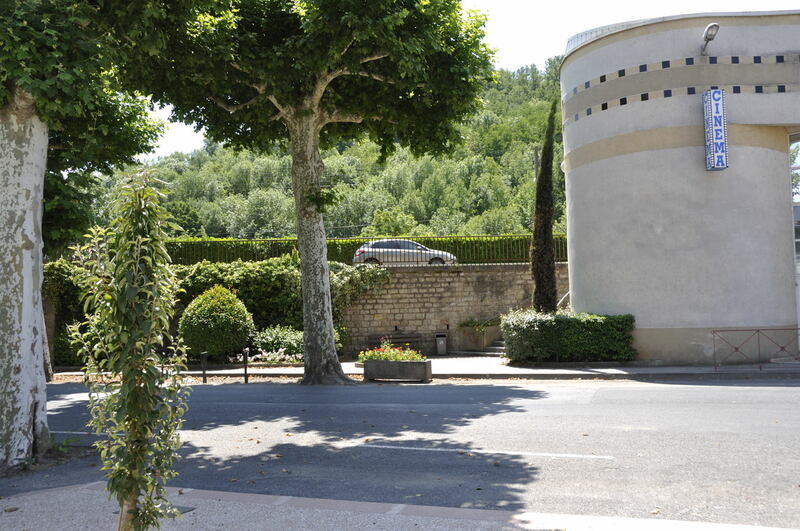 21 June 2011. 16 The D559 looking in the Tournemire direction. 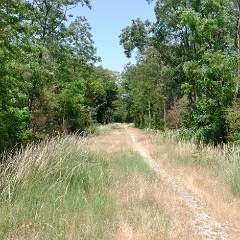 The trees are on the remains of the railway alignment at this point. 21 June 2011. 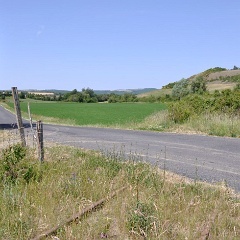 17 Looking towards St Affrique near St-Jean-d'Alcapes. 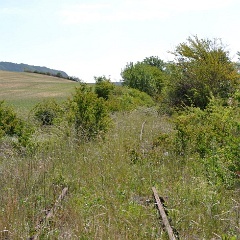 The railway embnakment is shown by the line of trees with the bridge pictured previously now well hidden but it is only a matter of yards away. 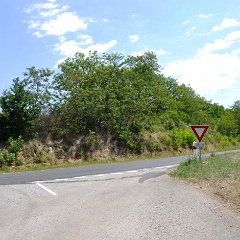 The way the road has been improved can clearly be seen. 21 June 2011. 18 A few kilometres east of St Affrique. 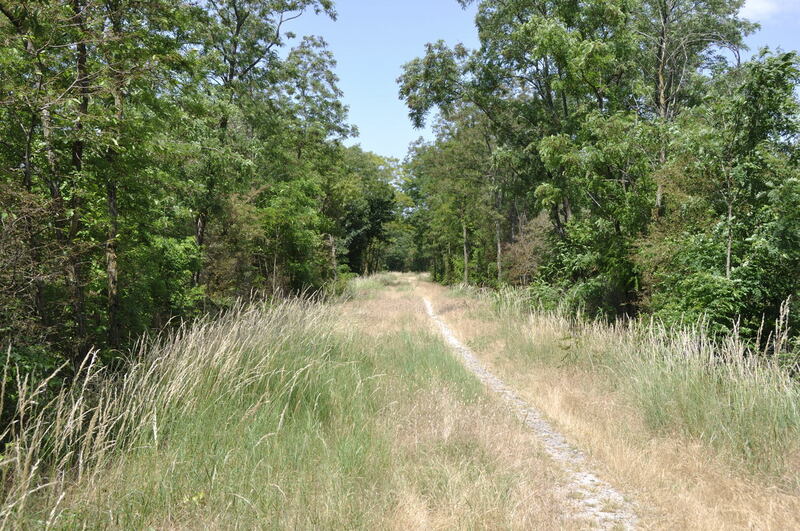 This section of the line is now a cycle path. 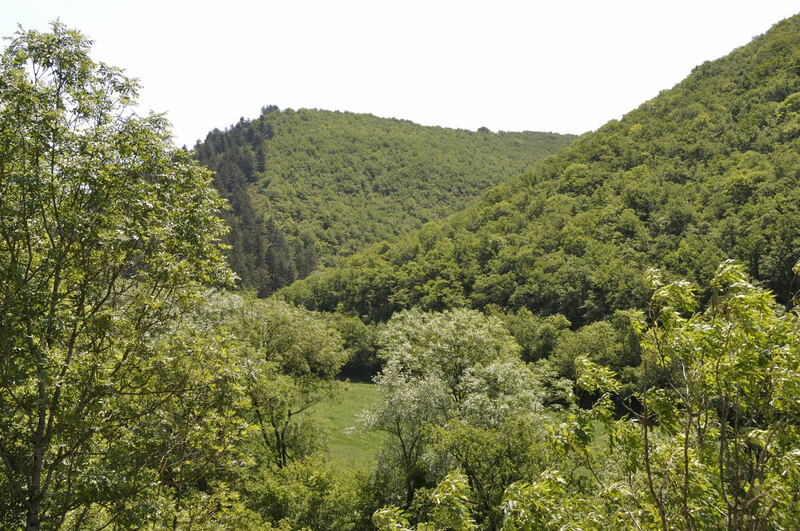 The route can be made out by the gap in the trees. 21 June 2011. 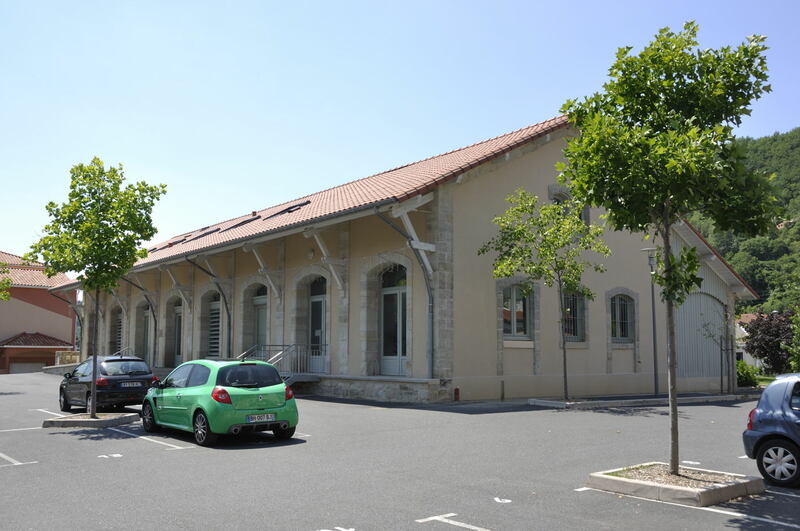 19 The former goods shed at St Affrique now has a new use. 21 June 2011. 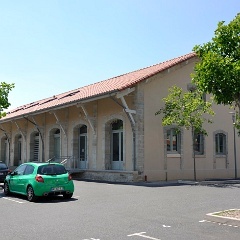 20 This is St Affrique station building. 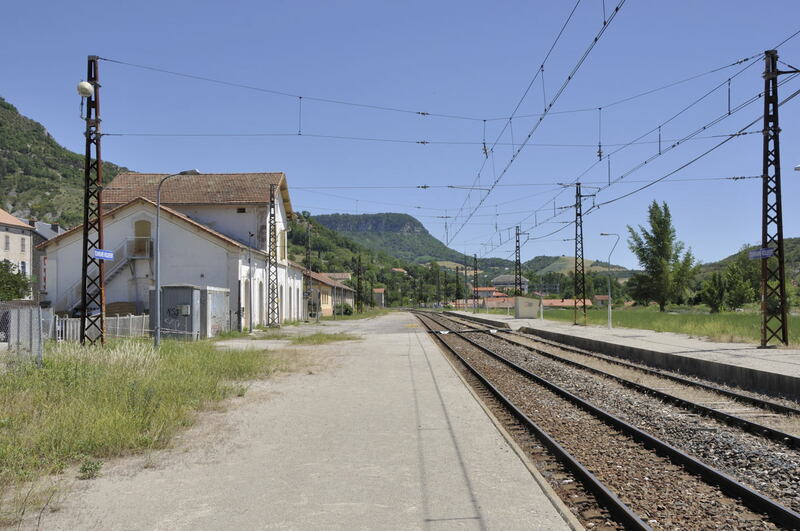 The platforms and tracks were here. 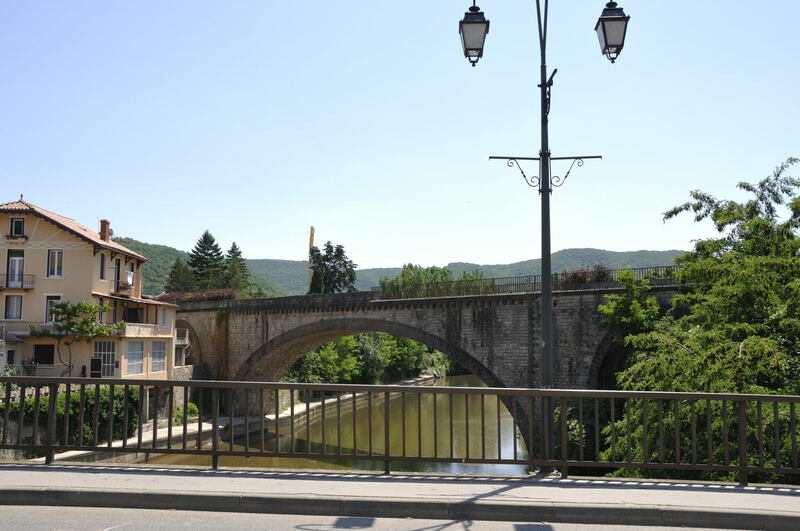 This view is towards Albi - the destination the line never reached. 21 June 2011. 21 A view of the good shed from the track side (as was). 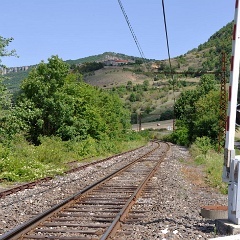 A crane and piece of track have been preserved hinting at the area's former use. 21 June 2011. 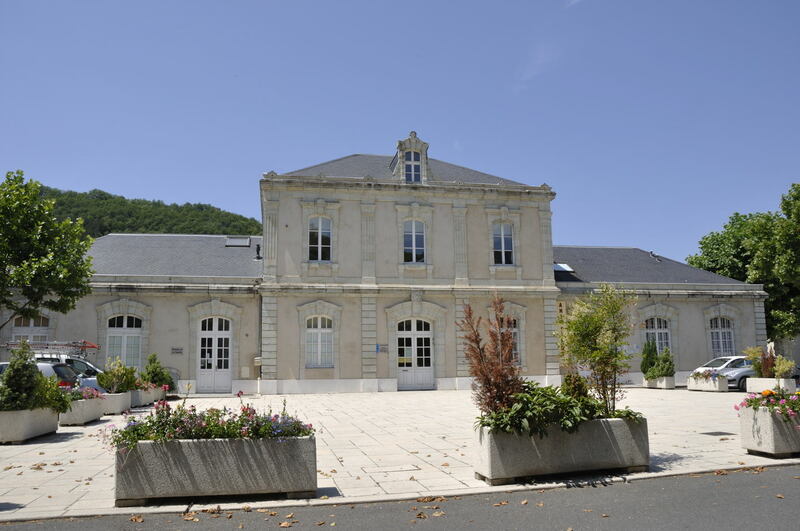 22 The station at St Affrique from the town and now car park side. 21 June 2011. 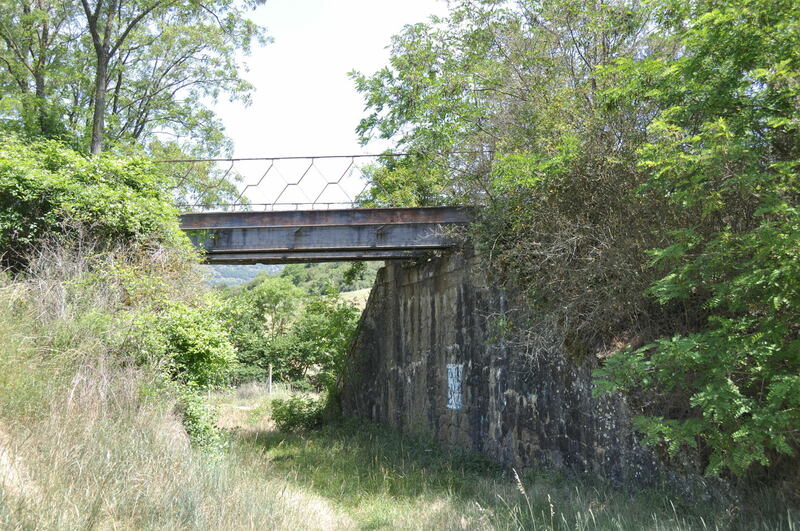 23 The car in this photo is running along a section of the line built towards Albi but never used as a railway. 21 June 2011. 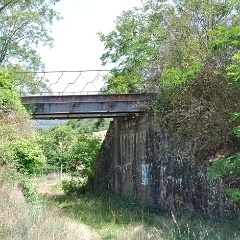 24 A little closer to St Affrique station is this never used for a railway 'railway' bridge, which now carries a road. 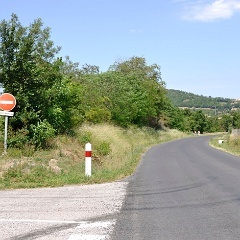 21 June 2011. 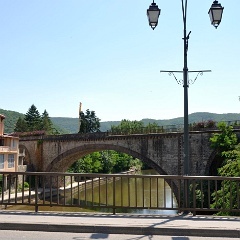 25 This bridge across the river carries a road but was built for the railway's extension from St Affrique to Albi. 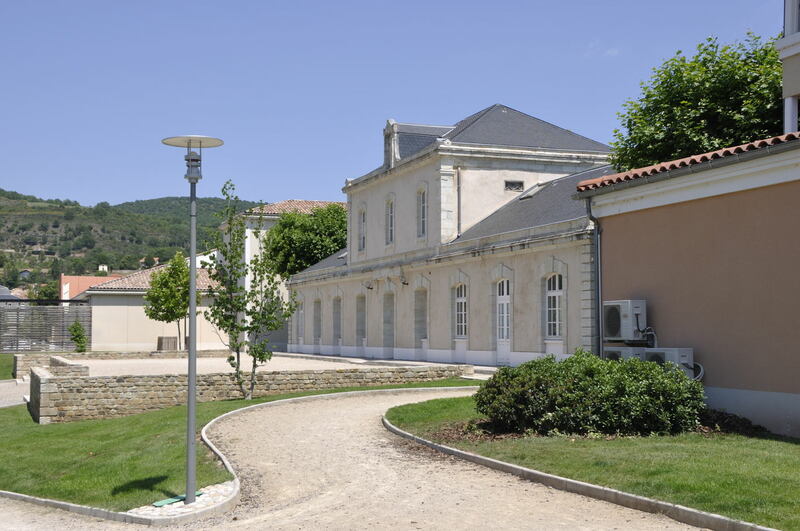 When this was built the extension was clearly a serious propostion. 21 June 2011.